The upcoming Italian general election will occur sometime before May 20th, 2017. While the exact date is yet to be established, its importance to the future of the Eurozone and EU can’t be understated. Italian voters will choose the members of the Italian Chamber of Deputies and the Senate, who will go on to select the Prime Minister and form a government to lead Italy. 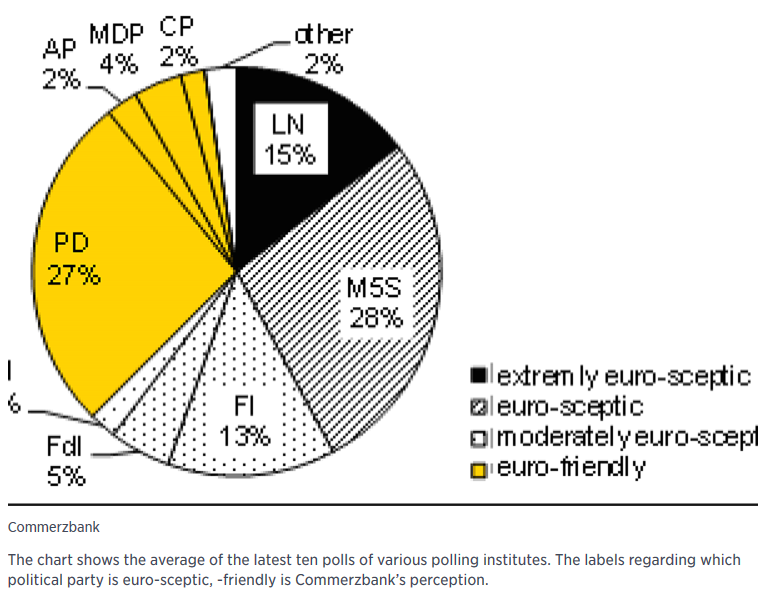 The following chart from Commerzbank, via an article from CNBC, shows why the election may prove so important to the EU and Eurozone,beyond its implications for domestic Italian politics. As the chart shows, virtually two thirds of Italian voters support Euro-skeptic or anti-EU parties in the upcoming election based on an average of the ten most recent polls. In fact, the Euro-skeptic ‘Five Star’ (M5S) party is the most popular single party in Italy,slightly out polling the pro-EU Democratic Party (PD) to whom the current Prime Minster, Paolo Gentiloni, belongs. Given that Italy has only witnessed 1% real economic growth over the last 17 years combined, nearly the worst economic growth in the world in the 21st century, it seems implausible that the same pro-EU politicians responsible for this track record can hold on to power indefinitely. Macron’s election victory in France has often been portrayed as ending the anti-EU movement. Yet Maçron’s victory came largely as a result of record low voter turn out and deeply flawed opponents. Drawing broader conclusions about the future of the EU based solely on the French election is unwise. Italian voters, if not soon the Italian government itself, may soon have something very different to say about the future of the Eurozone.